"Responsive, knowledgeable, and flexible service..."
"Diamond Technology provided valuable solutions and programming ability in support of our project"
"Professional, attentive, and highly competent"
"Reliable on-site services and project management"
Databases are the engines of most business IT systems. They house critical business intelligence, help support important business decisions, and carrying out hundreds of thousands of transactions each day. Database applications vary in price, cost of ownership, performance, functionality, and ease of use. 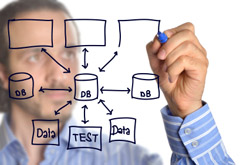 There is a huge choice of database management systems (DBMS). One of the major database products is Microsoft SQL Server. MS SQL Server's entry level version is free. This SQL Express edition has nearly all functionality and features of the full "Standard" version of MS SQL Server, with just a few minor limitations. SQL Server's beneficial technology and enhancements has been adapting and increasing, quickly. Column-based indexing, which turns out to be a great way to introduce NoSQL, was included in SQL Server. SQL Server 2014 introduced memory optimized tables. Future MS SQL Server enhancements will include: Query Store, Polybase, Stretch Database, JSON Support, Row Level Security, Always (Continuous) Encryption, and In-Memory Enhancements. MS SQL Server comes with an impressive tool set. Components such as SQL Server Profiler, SQL Server Management Studio, BI tools and Database Tuning adviser can save you a lot of troubleshooting, development, and administration time. Additionally, as a core product in the Microsoft technology stack, MS SQL Server support and documentation is extensive. If your organization's database system needs are exceeded by features provided in the free SQL Server Express version, then investing in the high level versions of SQL Server can be significant, depending on your organization's circumstances. If your organization has little or no existing Microsoft infrastructure, you will have to make additional commitments and investments in the Microsoft's ecosystem to use Microsoft SQL Server. This is related to the Cost obstacle in that the result would be purchase commitments to Microsoft server products which can, again, be costly. With investments in the Microsoft technology stack, your organization becomes dependent on Microsoft for any new features or improvements that your infrastructure might need. This, usually, means a 2 year cycle wait time for Microsoft updates. San Francisco County Extends DTI Contract for an additional 3 tears.